Kirk Cousins Is Not Better Than Joe Montana. So Let’s Fix Passer Rating. San Francisco legend Joe Montana climbs from 13th on the official NFL passer rating list to third on our adjusted list. According to the NFL’s official passer rating system, the most efficient quarterback in NFL history is Green Bay’s Aaron Rodgers, with a lifetime mark of 103.1.1 That makes sense: Rodgers is generally regarded as one of the greatest QBs to ever play the game. But if you scroll further down the list, the results become much harder to explain. In the world of passer rating, Kirk Cousins is better than Joe Montana; Derek Carr and Matt Schaub top Dan Marino; and, after one season, Broadway Sam Darnold is running circles around Broadway Joe Namath. Passer rating is often criticized as Byzantine (have you seen that formula? ), incomplete (it does not include data on rushing plays or sacks) and arbitrary (again, have you looked at the formula?). Yet its biggest shortcoming might be the way it is unmoored from changes in the game itself. Passing has never been more efficient than it was this season, in which the league’s average QB posted a rating of 92.9. That is remarkably high considering that a quarterback who posted a rating of 92.9 would have led all qualified passers in 15 separate seasons from 1950 through 1986. Clearly, the scale needs recalibrating. In the original conception of passer rating, an average rating was about 67. In 2018, only one qualified passer (Arizona Cardinals rookie Josh Rosen) fell below that threshold, and even then just barely (his rating was 66.7). But what if the standards for what makes a good or bad performance had evolved as leaguewide numbers changed? Pro-Football-Reference.com does a great job of adjusting for era with its Advanced Passing indices, which are centered on an average of 100 with 15 points representing 1 standard deviation in either direction. But I wanted to rescale the building blocks of passer rating itself to see how today’s passing numbers would translate to a rating if the NFL had simply allowed its rating system to change with the times. For any era, we can rescale what performance “should” lead to a given value in each category to keep the relative leaguewide distribution the same as it was when passer rating was first conceived.2 So while, say, Alex Smith’s 62.5 percent completion rate in 2018 was worth 1.0 point, so was Don Meredith’s 49.5 percent mark from 1962. Do this for every category in every season, and you have a stabilized version of passer rating that no longer spirals uncontrollably upward with each innovation in the passing game. Some ultra-high ratings change less than you might expect under this new method. Rodgers’s single-season record of 122.5 from 2011 tumbles all the way down to … 121.1. (He was very good that year.) But other seemingly immortal ratings, such as Kirk Cousins’s 99.7 mark this season, get knocked down quite a bit — in Cousins’s case, he falls to a much more reasonable 81.5 rating. (Anyone who watched a Vikings game this year would surely argue that this is more appropriate.) Similarly, Ryan Fitzpatrick’s 100.4 mark this season — yes, that is real, look it up — gets heavily penalized in the interception category (his 4.9 percent INT rate was more than double the league average), taking him down to an adjusted rating of 77.4. According to the NFL’s official system, there have been 93 qualified quarterback seasons since 1950 with a passer rating of at least 100.0, and nine of those happened in 2018 alone. After our adjustment, though, there have been only 46 such seasons since 1950,4 and only one of those happened this year — the 103.3 mark Drew Brees put up with the Saints. It’s still a golden age for passing, as nearly half of those 46 seasons have happened since 2000, but we’ve also filtered out 51 “false 100s” — seasons that cracked 100.0 on the old scale but not the new one — of which 47 have happened since 2000. The biggest beneficiaries of our changes are 1950s-era passers like Otto Graham, who originally rated in the 70s (discarding his eye-popping pre-1950 numbers, which were compiled in the upstart All-America Football Conference) but leaps up into the mid-80s after judging him in comparison with his peers. San Francisco 49ers legend Steve Young also gets a boost relative to other great QBs from history, reclaiming the No. 1 slot that he’d held in real life before Rodgers and friends came along. Who’s been overrated in traditional passer ratings? 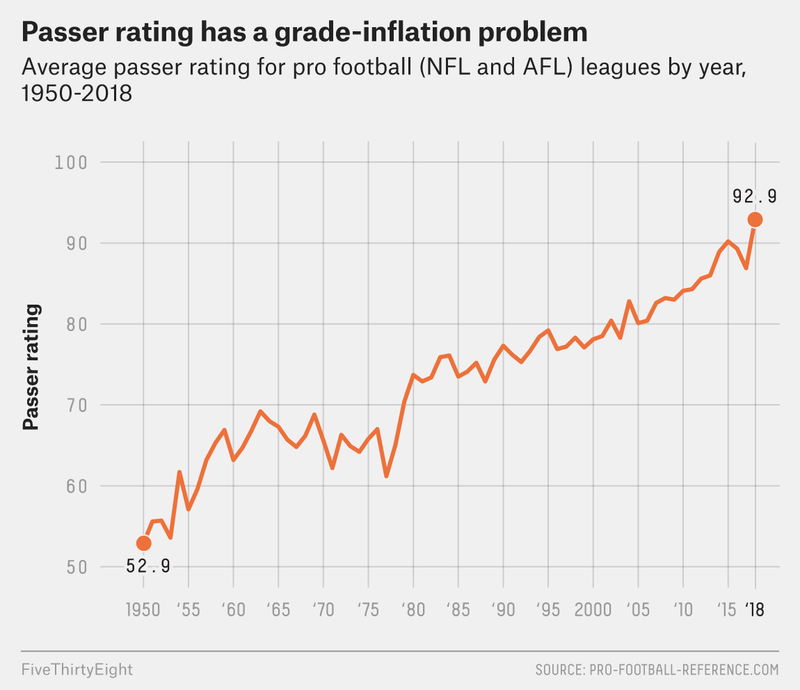 A change like this wouldn’t fix the rest of passer rating’s deficiencies, and it wouldn’t include all the fancy bells and whistles you’ll find in a metric like ESPN’s Total Quarterback Rating. But passer rating itself has always been a surprisingly decent metric within any self-contained era; the team with the higher passer rating (by any margin) in a game wins about 80 percent of the time. It’s the comparisons across eras that have become distorted as the game has changed over time. But a simple fix tethering modern stats to the standards contained in passer rating’s formula would go a long way toward restoring sanity to the metric you still see in every NFL box score and broadcast. The Blake Bortleses of the world might not like seeing their shiny 80-something ratings get dumped into the 50s, but it’s a change whose time has come. Pro football’s passer rating has a possible range from 0 to 158.3. Causing 2018 performances to score slightly higher on average, since this year was a better passing season than 2017. Four QB seasons cracked the 100.0 mark under the new system but didn’t under the classic passer rating.